Now Secure Erase SSD becomes more and more important, this is vital if you had decided to delete all your data or storage and return your storage drive into a new state which you first purchased. This action usually happen when your drive getting a lot of bad pruning or compression is not in an ideal situation. That’s when you need and want to return to it’s original state. 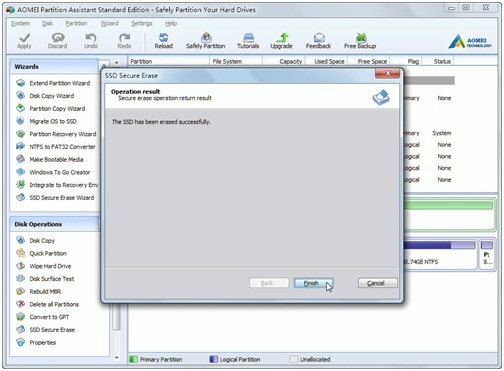 This partition helper is a free partition software, this software are able to permanently delete all your SSD file and prevent any unauthorized recovery from happening. AOMEI Partition Assistant is also a partition software that can help with partition size distribution, merging different parts of the partitions, partition divide, of course together with the creation and deletion function, and its new feature “Integrate to Recovery Environment”etc. In a word, AOMEI Partition Assistant can help you solve all the problems associated with the disk partition here. The latest AOMEI Partition Assistant version of 6.6 had released! What had change for the latest version here? It is able to support exFAT file. It supported both UEFI and Legacy BIOS boot modes. Remove any limitations on the mobile system boot in Windows 10 and later versions. Below is the download link for the 6.6 version. Step1. You need to prepare a Windows 7 computer. Connect your SSD to the Windows 7 computer. Then, free download AOMEI Partition Assistant, install and launch it. It will show you the basic situations of your hard drives. Then, click”SSD Secure Erase Wizard” at the left side, or right click the “SSD” keyword, then select “Secure Erase SSD”. Step2. It will give you a notice that this operation would erase all data on the solid state drive. If you have any important data on the hard drive, back it up before erasing. Click “Next” to move on. Step3. Here you need to choose the SSD that needed to be securely erased. Click “Next”. Step4. Here, you may have a problem that your SSD is in a frozen state. Click “here” in the following picture to do a hot swap for this SSD to relieve the frozen state. Step5. You can continue to secure erase SSD with AOMEI Partition Assistant, after reliving the frozen state of the SSD. When it complete, it will remind you that the SSD has been erased successfully. Click “Finish”. You will see the SSD shown as a block of unallocated space, because The Secure Erase process is complete complete and unmistakable. Secure Erase will wipe everything from your SSD and restore your SSD performance without hurting its lifespan. ThePartition Assistant is a Windows 7 partition manager that help you to secure erase SSD and help you manage your SSD at the best status such as SSD 4K alignment. AOMEI also supports to to create partitions before installing Windows after you securely erase SSD in Windows 10. AOMEI Partition Assistant also supports other SSD brands such as Kingston SSD , Samsung SSD, Crucial SSD, etc. Try it today!